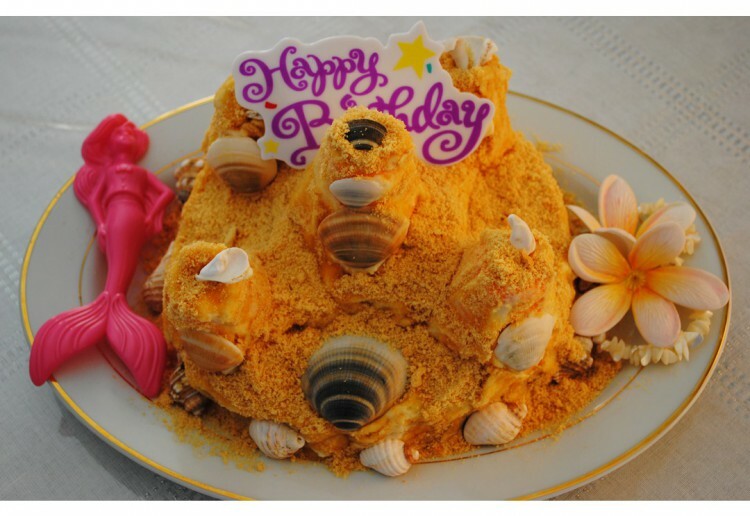 Home | Recipes | Children’s Sand Castle Cake. "Never Fail Sponge"
Children’s Sand Castle Cake. "Never Fail Sponge"
Introducing our family NO FAIL SPONGE WITH VANILLA FROSTING – it makes up to be a wonderful treat. I do hope you enjoy my sand castle creation. Have fun and please enjoy! Bring sugar and water to the boil. While still beating, pour in hot sugar and water mixture. Add egg yolks and turn off mixer. Fold in previously mixed sifted dry ingredients with a spatula. Bake at 180c for 15-20 minutes in 2 x 20 cm square tins which have been lined with baking paper. In the top of a double boiler, combine all ingredients BUT the vanilla, Beat 1 minute. Cook over boiling water beating constantly for 7 minutes or until the frosting makes firm peaks. Remove from the heat and add the vanilla. Beat until able to spread. Once cake has cooled spread a layer of jam between the two sponge layers and add a small layer of the frosting over the jam. Sandwich the two sponges together and ice with frosting. Place ice cream cones at each corner and one in the middle and frost these as well. Sprinkle crushed biscuits over the frosting(this represents the sand). Place sea shells and decorations onto the frosting and be amazed at your creation. Notes... This wonderful sponge is a NO FAIL RECIPE and indeed has never failed for me. The crushed biscuits over the frosting give the illusion of being sand and the fun sand castle is ideal for the young and young at heart. I would love to receive this cake for my own birthday – gorgeous coastal cake. I have put in an order with the family for this birthday cake as I truly do love it! A trip to the coast has also been ordered! The cake is gorgeous,any boy or girl would love it! This looks fantastic but yet so easy! Great idea. Thanks for sharing! Love no fail recipes and the cake design is super cool! THANKS for all the lovely comments folks ..and to those who have made it for children’s birthday’s I do hope it was a great success and your little one had a wonderful time. How adorable! The sand texture looks great. Thanks for sharing.